A superior blend Jojoba Seed, Avocado & Sweet almond oils with added Aloe Leaf and Rose Flower Extract to create the perfect body smoothing and nourishing companion during the months of pregnancy. 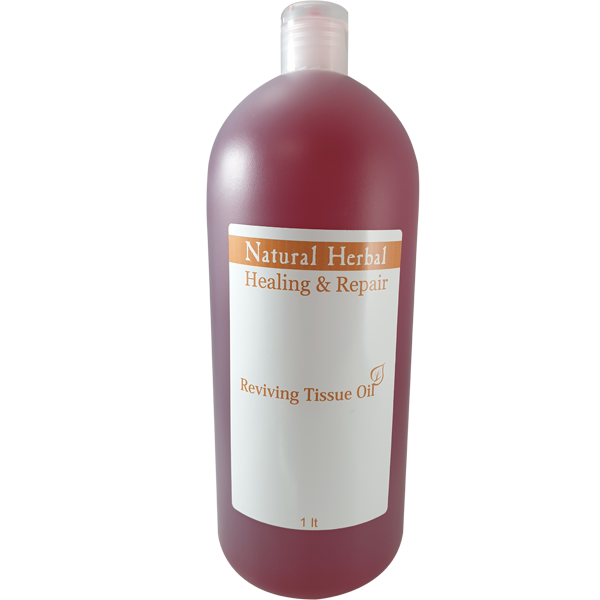 Healing & Repair Range Reviving Tissue oil is methodically prepared to give ultimate satisfaction. Avocado oil is packed with monounsaturated fatty acids and vitamin E, which are known to penetrate deep into the skin, moisturising all the layers and thus smooths the skin keeping it flexible and pliable. Added Jojoba Seed oil is known to have antibacterial and anti-inflammatory properties which aid in protecting the skin, and increases the moisture saturation thereby improving the skin texture of applied areas. Aloe Vera extract has abundant qualities and is known to be a superb healer of the skin, reducing the visibility of stretch marks and helps in preventing them if used Continuously and diligently during pregnancy through the stimulation of increased cell generation. Sweet Almond Oil has deep cleaning properties opening up pores and thus allowing enhanced absorption of vitamins and minerals like. Apply to cleansed skin to moisturise, repair and revive. Massage using gentle circular motions and leave on until fully absorbed. Leaves skin soft smooth, refreshed and glowing.